In 1943, the Gruen Watch Co. came out with a special watch for pilots and other flight personnel of Pan American World Airways, commonly known as Pan Am. At the time, Pan Am was one of the country's principal airlines, and the largest international carrier. The watch dial had numerals for 1 through 12 as well as 13 through 24, so that time could easily be read in military time to distinguish a.m. from p.m. While it was intended to do so, the model caught on with the general public, and several civilian models were made available after WWII. Over the next four years or so, Gruen came out with about 14 mens models and three women's models, presumably for female pilots and stewardesses (sorry PC-ers, but that's what they were called back then). The peculiar thing about this model is that it has sub seconds. 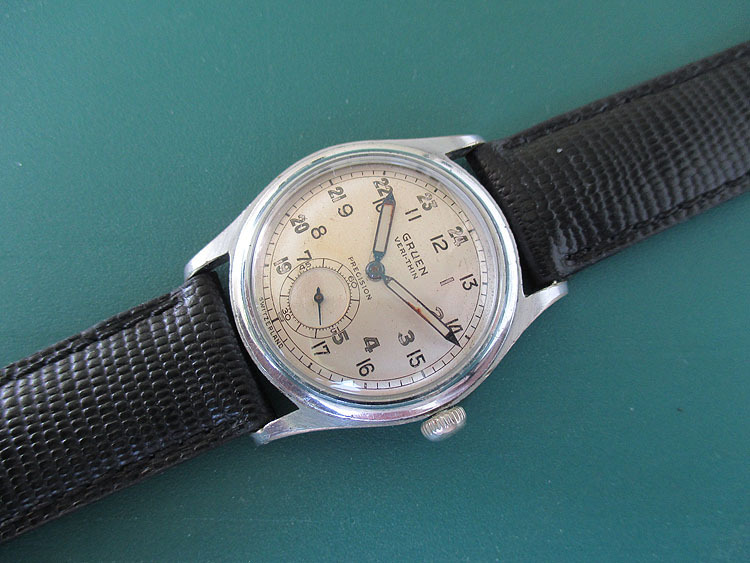 All other Pan Am models had sweep seconds hands, and the efficacy is obvious: It is much easier for a pilot to keep track of seconds using a larger center sweep seconds hand. 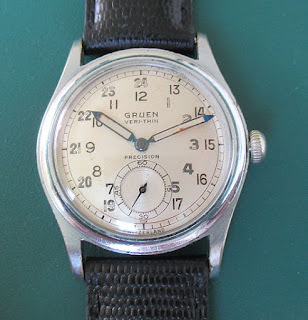 Why Gruen even made one with a sub-seconds is kind of a mystery, because it defeats the whole purpose of a watch designed for flight personnel! The short production time of the Pan Am (1943-1949) makes most any genuine Pan American model hard to find. I emphasize genuine because numerous "put-together" Pan Ams surfact on the market regularly. Rarer still is the sub-second variety. Few of these models were ever sold, and fewer still survive today. Thus, the sub-seconds Pan Am has become a sort of holy grail for collectors of this sub genre. The case for this model was not made by Wadsworth or Star, two of Gruen's usual case suppliers. Rather, it was imported from Switzerland. 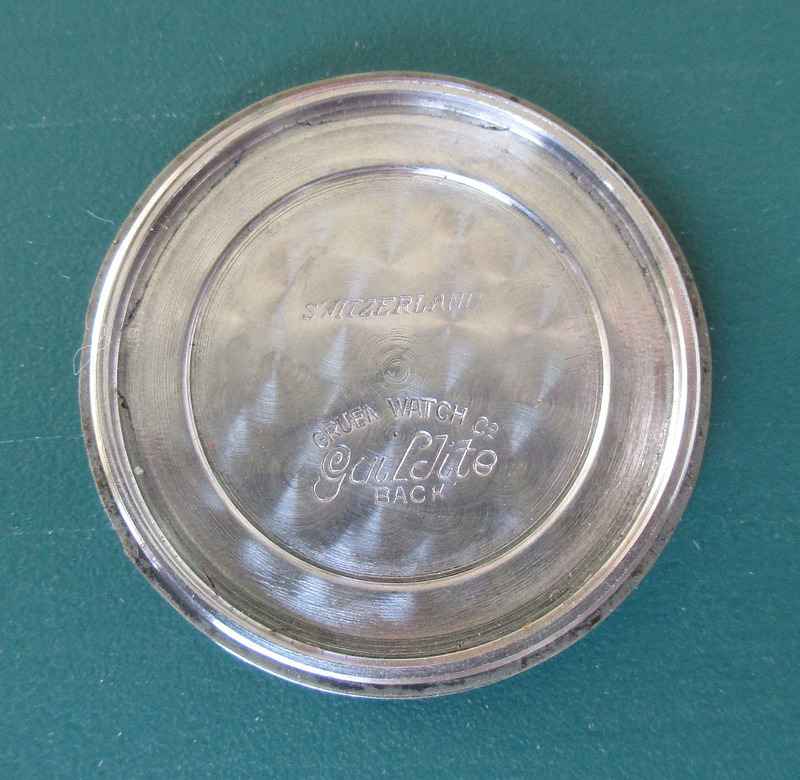 The bezel was made of base metal, while the screw-on back was made of Guildite, which was Gruen's terminology for stainless steel. 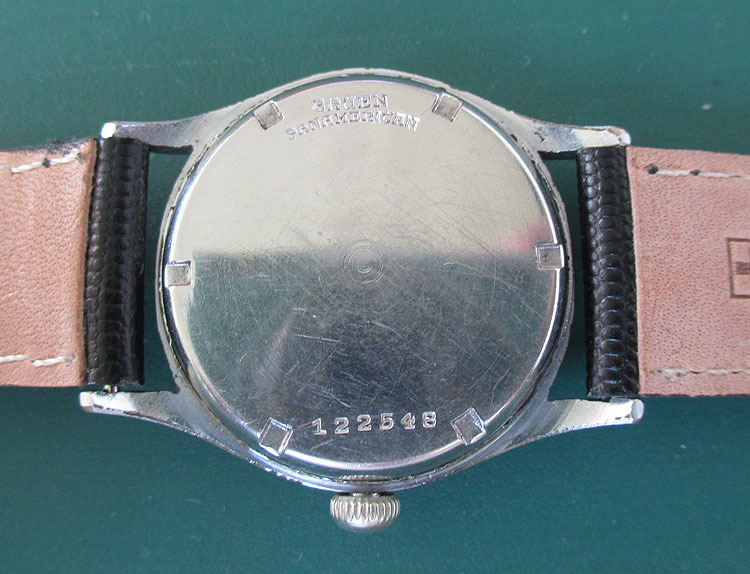 The caseback is stamped "GRUEN PANAMERICAN" on the outside and marked "Guildite" and "Switzerland" on the inside. This imported case was made for at least one other model (with the usual sweep seconds hand) and possibly others. It is 32mm diameter, and close to 40mm long, lug tip to lug tip. 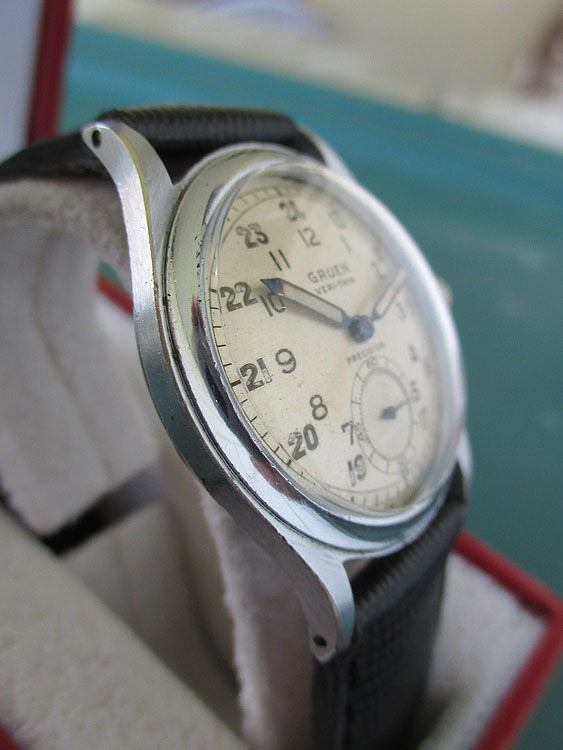 It was a very standard size men's wristwatch for its day, though is small by today's standards. As you can tell by the profile image above, the case has pierced lugs. The dial and hands are original. 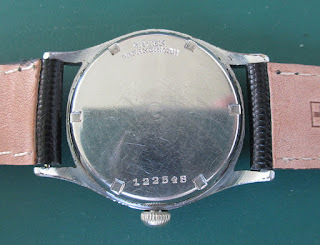 Some of the luminous has fallen from the numerals and hands, very typical for a watch of this vintage. And look at the dial carefully. Notice anything about the luminous on the numbers? It's only only on the 18-24 on the outer ring, and 1-5 on the inner ring. The rest of the numbers are just black ink. This is because the night time hours were set up to glow in the dark ... a hand feature for a pilot. Also on the dial, you see one small scratch near the center post where no doubt some watchmaker was careless removing the hands. But overall a very nice original dial, and I wouldn't refinish it in a million years. 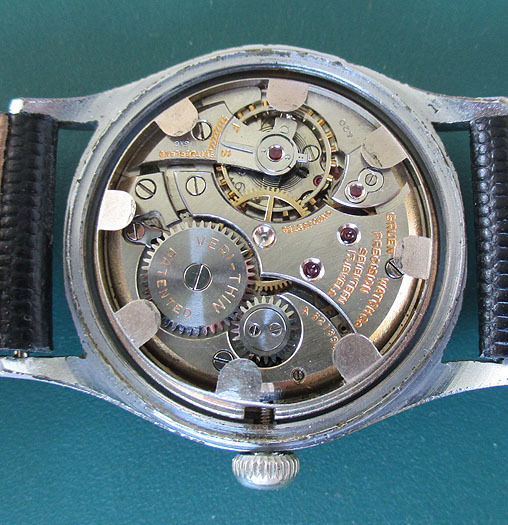 The engine on this model is the Grade 420, an 11.5-ligne movement that began production in 1942. Normally, you would find a Grade 420SS in this watch, the primary movement used in Pan Am series. Overall, I would rate this specimen a very good, a solid 70 to 75 on a scale of 100, with 100 being new old stock. There is some pitting on the bezel, which is consistent with a watch that was used but not abused by its original owner. The watch was (and is) in good running order when I received it, and is keeping time to the minute within a 24-hour period. Thus, I have not had the watch serviced. 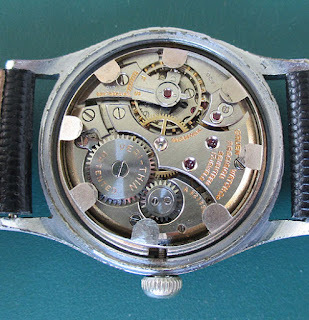 This watch came out of an estate, and I am confident it is 100 percent original, and not put together from parts. I have several Pan Ams in my collection, but this is the first sub-seconds model I have ever acquired. 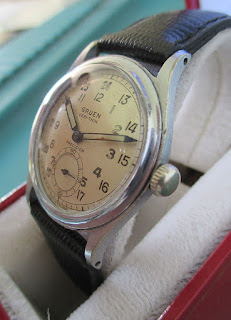 This is one of those "must-have" watches for any serious collector of Gruen wristwatches, especially the Pan Am series.